In the midst of an industry where stories of believers are rare, even a mid-school science fiction Super Seven superhero series is fun to read. The series will also entertain your pre-teen or young teenagers — for the superheroes in the Super Seven are from ten to teen in age. 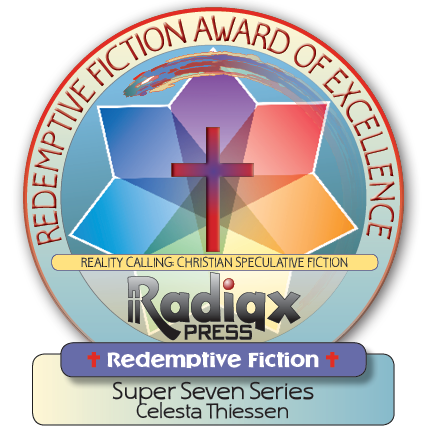 Celesta Thiessen has become an established Christian fiction author whose books are always a joy to read. The seven-book Super Seven series builds on her reputation. Her superheroes are using natural gifts on the planets of her built worlds. They’re a gift like intelligence, beauty, and the other individual pieces people are given to live with in their lives. The children use gifts like telepathy, fire, flying, super strength, and so on. However, there’s a huge difference on these worlds. Everyone, Gifted or not, has a chance to become a believer! There’s no preaching—just subtle changes in the heroes’ lives after they believe. It’s quite effective. Of course, because the world cannot control the Gifted, they try to kill them—actually aliens take many of them away. Many of the non-believing gifted are living in a trashy city they control for self-preservation. As you can imagine, this is a less than good solution for them in most cases. The hero children have all lost parents to death or the aliens. No one knows who or what or where these supposed aliens are. They don’t know if their parents are alive. And: I’m not going to tell you. All I’ll say is that I enjoyed the ride. It’s a fun read. But then I’m getting more child-like or childish every year—I’m not sure which. 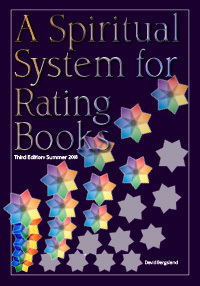 But I can easily testify that the books are enjoyable for people from eight to seventy-two, at least. They are all very short [45-60 pages or so]. So, they will not be intimidating to children still gaining in reading skill. 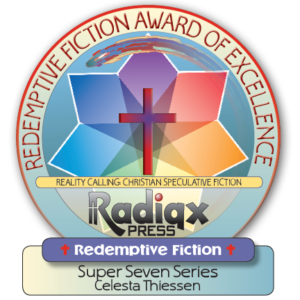 This mid school science fiction Super Seven series is redemptive! This is Good News, both for the Gospel and for the potential of the series for the Kingdom. Our prayers are added to Celesta’s that this series can be used by the Holy Spirit in the lives of young people. The spiritual reality is gently evangelical. But there’re no doctrinal positions. Everything flows quite realistically—even though I would obviously like to see the children more powerful spiritually, in the Lord. But then these gifts are natural talents, not gifts to individuals for the edification of the Body as they are in our reality. The first two books appear to be permafree—at least they were free when I purchased them. Celesta generously gave me readers’ review copies of the other five books in this seven book series so that I could review the entire series. She put no expectations on the gift of the last five books in the series.